When it comes to young parenthood, there's a lot of focus on preventing teen pregnancy. 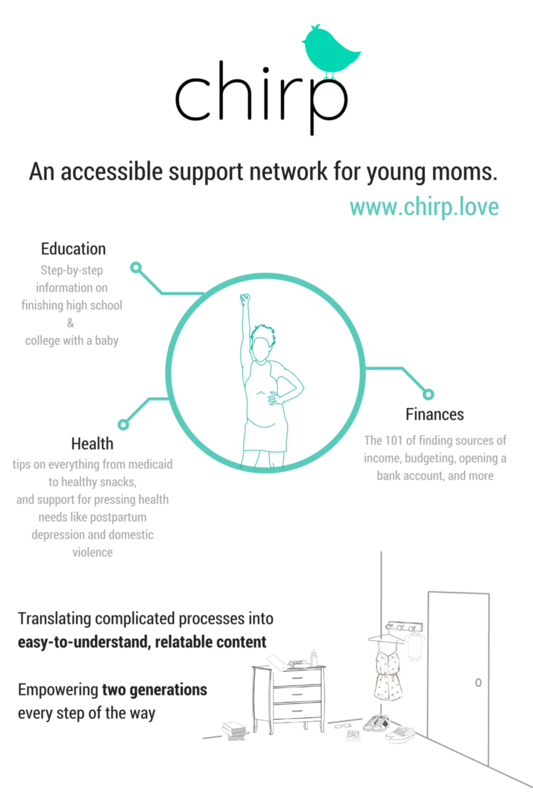 Although we support and applaud initiatives focusing on teen pregnancy prevention and resonate with their mission, Chirp is focusing on the overlooked population of about 250,000 young people every year who unintentionally become parents. For these young parents, it's very difficult to figure out who to turn to for advice, how to manage expenses, your health, and go to school. That's why we decided to create Chirp -- a relatable source of information & moral support for young parents everywhere. We're also focused on promoting equity for all babies, recognizing that uncomfortable disparities in health-related, educational, and financial outcomes exist. Phoebe and Risham started Chirp as a sensor & app to prevent babies from being accidentally left in hot cars. Now, after several iterations to figure out how to most effectively impact the next generation of young parents & their babies, we've decided to focus on young parents, people at the age we think we can relate to most. We're excited to be on this journey. Risham & Phoebe at Kirkland house, where we're roommates!